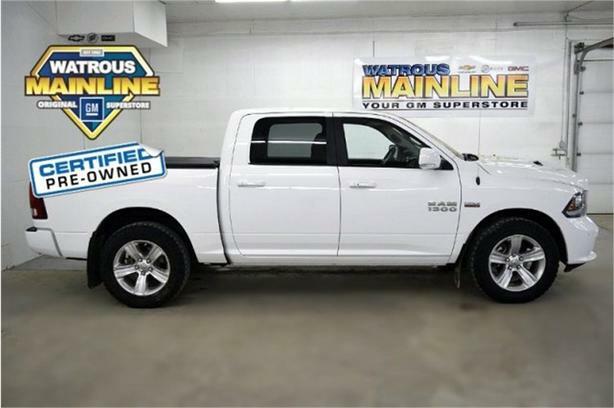 Check out this certified 2014 Ram 1500 Sport. Its Automatic transmission and Regular Unleaded V-8 5.7 L/345 engine will keep you going. This Ram 1500 has the following options: TRANSMISSION: 8-SPEED AUTOMATIC (8HP70) (STD), TRAILER BRAKE CONTROL, SPRAY IN BEDLINER, SPORT PREMIUM GROUP -inc: Air Conditioning ATC w/Dual Zone Control, 9 Amplified Speakers w/Subwoofer, Humidity Sensor, SPORT PERFORMANCE HOOD, REMOTE START & SECURITY GROUP -inc: Remote Start System, Security Alarm, REAR WINDOW DEFROSTER, RAM SPRING SPECIAL, RADIO: UCONNECT 8.4AN AM/FM/BT/NAV -inc: Uconnect Voice Command w/Bluetooth, and QUICK ORDER PACKAGE 26L SPORT -inc: Engine: 5.7L V8 HEMI MDS VVT, Transmission: 8-Speed Automatic (8HP70). Stop by and visit us at Watrous Mainline Motor Products Ltd, 208 1st Avenue East Box 70, Watrous, SK S0K 4T0.